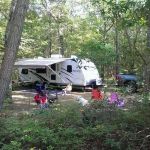 Ask fellow campers about "Oakleaf Family Campground" and nearby attractions. We came here on a whim. Showed up with no reservation. They welcomed us in with a nice wooded site. This is definitely a smaller campground, mostly seasonals but everyone seemed friendly. Definitely worth a return trip. I would say the only complaint I'd have is that their dump station is on the wrong side of the road make sure you have at least a 15' hose. We camped at Oakleaf Family Campground in a Travel Trailer. Owners seemed less than thrilled to have us there. We are full-timers and move frequently. We think we are ideal campers (no kids, no dogs, quiet, no parties, etc.). It was very strange, we felt like we were always being 'watched' so they could tell us we were doing something wrong. They did tell us we were driving too fast but it was hard for us to believe because the roads were dirt and uneven with rocks so who would drive fast?? We were in a back in spot that was very hard to maneuver around all the tree limbs. They say they are big rig friendly but we felt it was very tight for our 35 ft. rig. Turning corners was a major effort have to back up to miss large boulders on one side and tree limbs on the other. We did have a very nice fire pit. The dump station is very hard to get to and is on the wrong side for most RVs. We won't be going back here. We camped at Oakleaf Family Campground in a Fifth Wheel. 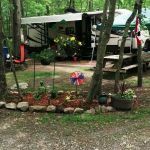 Are you affiliated with Oakleaf Family Campground ?